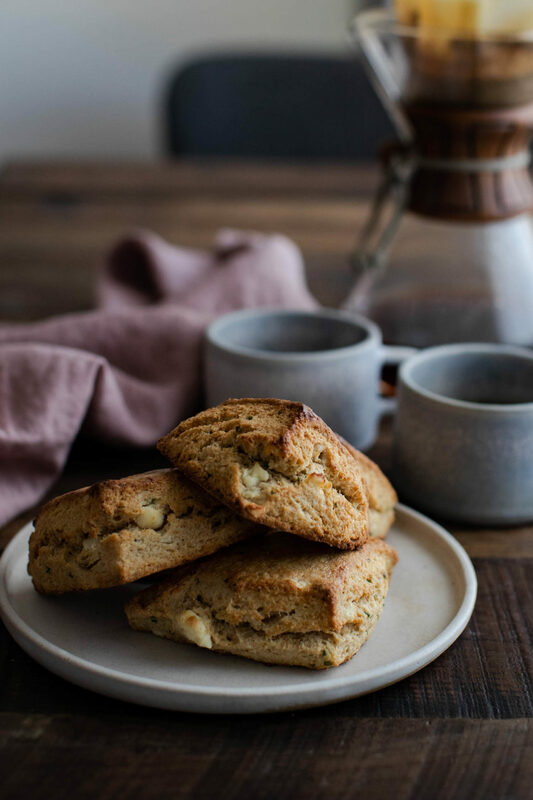 Delicious and flaky whole wheat scones are only about 30 minutes away. Make sure you pick up whole wheat pastry flour or you can swap all purpose in if needed. Preheat the oven to 425 ̊F. Cover a baking sheet with parchment paper. Place the flour, baking powder, sugar, and salt in a medium bowl. Add the cold, cubed butter and using your hands, rub the butter into the flour. The end result should be a flour mixture that looks crumbly with pea-sized pieces of flour-coated butter. To the butter-flour mixture, add the minced chives and crumbled feta. Stir briefly to combine. In a separate bowl, whisk together the egg, heavy cream, and milk. Pour into the dry ingredients and stir until just combined. Turn out the dough onto a floured surface and gather into a semi-tight rectangle. Fold like a letter and flatten out again, using a rolling pin, into 1 ½” or so thick rectangle. Continue twice more then flatten once more. Using a knife or bench scoop, cut into 8 squares or triangles. Just remember- don’t overwork your dough to keep the butter still in small pieces!